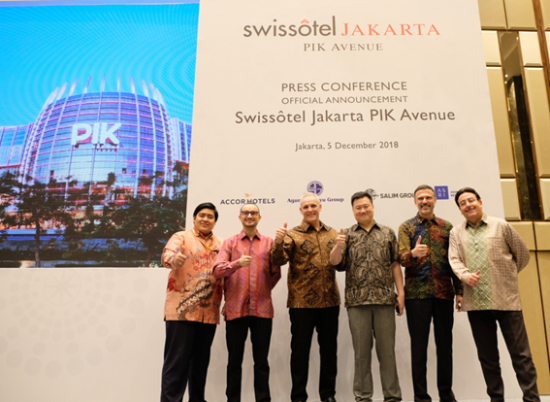 Jakarta, 21 December 2018 – Swissôtel Hotels and Resorts is set to make its first debut in Jakarta. Opening mid of 2019, Swissôtel Jakarta PIK Avenue is located in a mixed-used lifestyle mall complex. Designed by EDG Design, the hotel features 412 spacious guest rooms, six dining outlets, an executive lounge, the Pürovel Spa & Sport facility as well as the city’s largest event space of 3,044 square meters that can accommodate up to 3000 guests in its ballroom. “This is such an exciting time to introduce the Swissôtel brand into Indonesia and particularly Jakarta to complement the Group’s growing portfolio of city and resort destinations throughout the region,” said Garth Simmons, COO AccorHotels Indonesia – Malaysia - Singapore. Staying true to Swissôtel’s brand promise of promoting Swissness and vitality, the hotel will offer a very inspiring atmosphere which will be bolstered with the gracious Indonesian hospitality. Swissôtel is synonymous with Swiss hospitality and all there is to love about Switzerland – quality, efficiency and care. Giving guest the peace of mind they need to explore the world and discover life’s true rewards is at the essence of any Swissôtel stay. One of the world’s greatest megalopolises, Jakarta was named among the top ten fastest growing tourism cities in the world based on the World Travel and Tourism Council (WTTC) 2017. Jakarta has a rich, varied history, and is a city of exciting metamorphosis - with its bustling traffic, its strong affiliations to its own historical roots, and a hub of development in Indonesia. “We are proud to partner with AccorHotels in bringing the premium hotel brand to Indonesia with the development of Swissotel Jakarta PIK Avenue. Pantai Indah Kapuk has evolved to become a trendy lifestyle destination and this partnership will enhance our mixed-use proposition that caters to niche travellers with its high-end residential and commercial development. ” Said Alex Kusuma, CEO ASRI, the lifestyle arm of property developer, Agung Sedayu Group, owning company. As the latest landmark in the city located within a high end commercial and residential hub, Swissôtel Jakarta PIK Avenue combines the renowned Swiss hospitality with contemporary design, personalised service and charm. Founded in 1980, the brand offers freshness and vitality rooted in the tradition of Swiss hospitality. Part of AccorHotels, Swissôtel Hotels & Resorts has more than 30 hotels globally including flagship properties such as Swissôtel The Bosphorus in Istanbul, Swissôtel The Stamford in Singapore and Swissôtel Krasnye Holmy in Moscow. The brand’s contemporary Swiss style combined with local flair, its focus on vitality, sustainability and a deeply-rooted commitment to quality infuse the Swissôtel experience, ensuring custom environments where guests can recharge and feel at ease. One of the best-known Swiss brands in the world, Swissôtel Hotels & Resorts offers contemporary hotels infused with the freshness and vitality of alpine energy, rooted in the tradition of Swiss hospitality. Respected for its intelligent design, quality craftsmanship and mindful approach to sustainability, Swissôtel gives its guests peace of mind to explore the world, discover life’s true rewards and embrace opportunities to ‘live it well’. The Swissôtel brand was founded in 1980 and today numbers more than 30 hotels globally including flagship properties such as Swissôtel The Bosphorus in Istanbul, Swissôtel The Stamford in Singapore and Swissôtel Krasnye Holmy in Moscow. Swissôtel is part of AccorHotels, a world-leading travel and lifestyle group which invites travellers to feel welcome at more than 4,600 hotels, resorts and residences, along with some 10,000 of the finest private homes around the globe.